So anyway, I came across Brody Condon‘s work a few weeks ago on the L.A.-based experimental media blog Blur + Sharpen (written by the incredibly gifted writer and super-smart maven of medias old and new, Holly Willis, a former classmate of mine at USC’s School of Cinema Television from way back when) and I’ve been fascinated with it ever since, largely because it seems to tap into a lot of the crazy that Tom was suffering from in the movie, that desire to transcend dull reality and experience something visionary and heroic, but Condon projects this desire into the era of video games rather than the book, paper and pen way of playing RPG’s. Condon is an American artist born in 1974 in Mexico, and is currently based in New York. 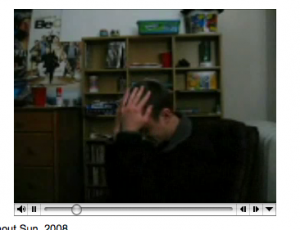 His 2008 DVD Without Sun is a 15 minute compilation of footage found on the Internet of various random people tripping HARD on psychedelic substances. Condon’s website describes the piece’s focus as on “the exterior surface of the ‘projection of self’ into visionary worlds,” noting that it was named after Chris Marker’s classic video work Sans Soleil. Click on the image below to be taken to Condon’s website and a brief clip of the video. If you’re in Los Angeles this weekend, you can check out a live performance on July 18th at Machine Project that features two actors recreating scenes from Condon’s video. Death Animations is a three hour performance that also took place at Machine Project. Inspired by Bruce Naumannâ€™s 1973 work â€œTony Sinking into the Floor, Face Up and Face Downâ€, it featured nine dancers wearing video game type armor who recreate Naumann’s performance in slo-mo as “high volume binaural beats” play in the background, apparently in an effort to induce some form of out-of-body experience among the audience and/or participants. (Click images below to be taken to a performance excerpt). 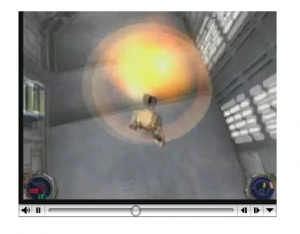 And Condon’s Suicide Solution, 2004,Â is a compilation of suicide scenes from various first- and third-person video games.Â (Click image for video clip). “Combining the fantasy Live Action Role-Playing (LARP) subculture, public sculpture, and ritualistic performance art, Twentyfivefold was a series of physically and psychologically intense live games involving 80 players which evolved over the Summer of 2008. The events were organized by the artist Brody Condon for the Sonsbeek International public sculpture exhibition in the Netherlands. Looks kind of amazing, right? If Condon ever wants to organize something like that in Chicago I am so there. Strangely, I see echoes of Mazes and Monsters in Condon’s project. Going back to real life must feel pretty sucky after playing a fully immersive game like that. I wonder if any of the participants went crazy afterwards, unable to come down from the high of worshiping the broken mirror god. I’d be willing to take the risk. We were talking about blog posts that correspond to podcasts, check out “Death by Design” on BAS in the archives. They havn’t done too much death persformance since then, though. I wasn’t really in the game TM (still regretting it) but experienced several larp encounters while working for the exhibition: very memorable! and inspiring to DIY. you know about Case? btw I agree: Holly’s doing a great job!